Revisiting the fear in everyone of what lies beneath the water's surface with an equally gruesome tale of Great White attacks upon the community of Rhode Island, known as Amnity. Roy Schneider stars as Deputy Brody again, who seems to be the target of another instance of underwater mayhem upon his family. The beaches are open again, but so is the shark's mouth as it pursues to quench its thirst for blood. Having faced a shark of this magnitude before, he seems to be the perfect opponent for protecting the people of this community, but will he succeed or be consumed by his obsession? Upon the opening of the beaches, Brody's son goes against his strict rules of not going in the water until it is safe. After sneaking away from the house, the son teams up with a band of friends that are dead set on sailing the waters by boat, no matter the threat. As the shark begins taking captives, the team of friends find out they themselves are not alone. The shark has now targeted them as its next set of meals. Finding themselves being picked off one by one, the group of young adults tries to reach a safe distance from the shark, but fails until the aid of Deputy Brody comes to their rescue. His personal vendetta against the shark only rivals that of the one first developed in the first story. Finding his son by distress signal and search, he now is determined to save each of the remaining youths' lives. The shark proves to be a worthy adversary as Brody puts his own life in the line of danger. The conclusion of the film shows the reasons why the Great White shark has become one of the most feared predators in the history of mankind and before. 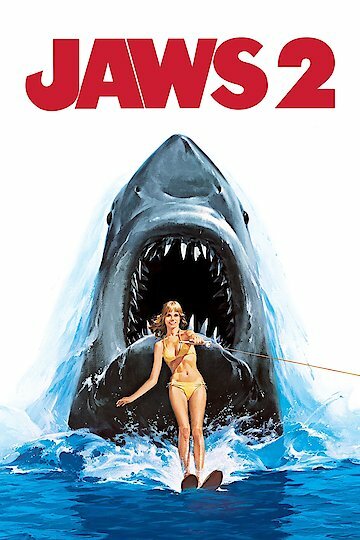 Jaws 2 is currently available to watch and stream, download, buy on demand at Netflix, Amazon, Vudu, Google Play, FandangoNow, iTunes, YouTube VOD online.